A group of former political prisoners held captive on a Patagonian island are calling for the Chilean government to pay them compensation in a case that could help bring justice to thousands of victims of torture. In the days after a military coup led by Augusto Pinochet took control of Chile on 11 September 1973, the first prisoners were arriving at Dawson Island. "We were very afraid, it was dark, it was still snowing, the uncertainty of what was happening to us was complete," said Osvaldo Puccio Huidobro, who was taken to the island with a group of government ministers and close friends of the deposed president Salvador Allende. Hundreds of prisoners soon joined Mr Puccio on Dawson. Wooden barracks were set up that were inspired by the concentration camps of World War Two, but even without the barbed wire and watchtowers, there was no way of escaping an island surrounded by the icy waters of the Magellan Strait. "We were badly fed, malnourished, physically weak. People had come straight from being tortured on the mainland and were forced to do hard labour," said Libio Perez Zuniga, a former political prisoner who is now seeking compensation from the Chilean government. On Saturday, Mr Perez and 30 other former prisoners released a statement calling for the government to obey a Santiago court ruling and pay them $7.5m (£4.8m) in compensation for what they suffered on Dawson Island. "It was a historic decision," said Victor Rosas Vergara, the human rights lawyer representing the former prisoners. "All of the requests that have been made by political prisoners had been rejected by the court until now." If the Chilean government accept Wednesday's verdict, it could open the way for 38,000 victims of torture to receive substantial compensation for the first time. "If the decision to compensate is upheld as it is, I think it would an especially important ruling for a whole series of cases that are beginning to reach the courts," said Claudio Nash Rojas from the Centre of Human Rights at the University of Chile. But the prisoners waiting for the government's response are worried that instead of upholding the verdict, the government may appeal to Chile's Supreme Court where it could be overturned. "These demands are invariably rejected because they say the victims should have made them in the first four years of having been made prisoner, right in the middle of the dictatorship," said Mr Rosas. 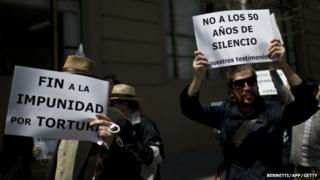 Getting justice for victims of torture in Chile has always been complicated. "On the one hand, there is still no definition of the crime of torture in Chile," said Maria Jose Eva Parada, researcher for Amnesty International. On the other hand, the government's human rights programme can only pursue cases of murder and kidnapping. "It has no mandate to investigate torture, and this is a shortcoming that restricts access to justice and, in effect, results in perpetual impunity in cases of torture," said Ms Eva. The supreme court recognised the problem on Wednesday. As it rejected a case of compensation for 603 former political prisoners it said in its closing statement that a "definite, effective and efficient solution" for victims of torture was needed and that a new law should give victims "appropriate compensation" without having to go through the judicial system. But this would probably come too late for the former prisoners of Dawson Island. Four out of the 31 who put their case before the courts have already died in the seven years of legal proceedings. For those that remain, they believe that proper compensation would help bring an end to the uncertainty that followed them when they were released from Dawson more than 40 years ago. "When I left Dawson it was with the same feelings I had when I arrived - uncertainty, fear. What you feel when you are without your liberty and are handed over completely to people that you hardly know," said Mr Puccio. But the former prisoners agree that no amount of compensation can be enough to heal the past. "Material compensation cannot resolve the underlying problem, of the hurt that was already produced," said Mr Perez. "I think that if there is a compensation, it is the pride that each of us feel that, in a moment that was painful for Chile, we were on the side of what was right," said Mr Puccio. Healing the rest, he said, would be impossible.